One of the fastest - and cheapest - ways to cross the English Channel is via Eurotunnel. Whether you cross through Eurotunnel for a short excursion or as one leg of a European touring vacation, you just drive aboard Le Shuttle, and, hey presto, 35 minutes later you're in another country. DATELINE: JANUARY 10, 2019 - Immigration and Customs procedures may change following the Brexit deadline of March 29, 2019. If you are traveling from outside the UK your passport and visa requirements and processes will remain the same, however if after the deadline, the UK is outside the EU, passport and visa checks will take a bit longer. Similarly, custom checks and inspections of your vehicle could also take longer and the amount of goods you are allowed to carry between the UK and the EU could be limited. Unfortunately, how this will affect you depends on factors that have not yet been decided. Whether the UK leaves the EU with an agreed deal (soft Brexit), no deal (hard Brexit) or even whether we actually leave at all remains up in the air. What you can expect is that it will take longer to cross the channel because of the checks. And, since lorries carrying goods through the tunnel will also be subject to more thorough checks, the delays may be considerable. You can keep up to date on developments in immigration rules with these guidelines from the UK Department of Transport. and in customs regulations from HM Revenue & Customs. At the moment, the published information is mainly advice for companies involved in cross border trade, but there is likely to be more information for tourists once Brexit is confirmed. There may also be a short grace period. You don't actually drive through the Channel Tunnel. You sit comfortably in your own car (or in a minibus if you're a cyclist) while you are carried through the tunnel on a special train, the Car Transport. Nobody really calls the the tunnel the "chunnel" anymore. It is called the Channel Tunnel or Le Shuttle for going by car or Eurostar for the high-speed, passenger-only service. What is a Trip Through Eurotunnel Like? First off, if you're not the greatest traveler when it comes to long tunnels, you have nothing to worry about. Crossing the channel on the car transporter has to be the easiest,quickest and most comfortable way to do it ever. Boarding is a snap. We showed up early for our train and actually got on an earlier departure. Driving on Le Shuttle, the Eurotunnel Car Transporter, was a bit like driving into a garage. The inside was painted a sunny yellow and the lights stayed brightly lit throughout the journey. So bright, in fact that, while we chatted happily, the dog snoring, oblivious, in the back seat, we raced across the French countryside for at least five minutes before we noticed that the carriage windows had turned from tunnel black to sky blue and we'd actually gone all the way through. Each Eurotunnel Shuttle can carry six cyclists. The bicycles are carried on a specially adapted trailer and the cyclists travel in a minibus. To book a bicycle crossing, telephone the sales support department, weekdays, from 9 a.m. to 5:30p.m. on 44 (0)1303 282201. Cycle crossings must be booked 48 hours in advance. Find out more about cycles on Le Shuttle. If you are traveling with a larger group, ring the sales support department on the same number to discuss arrangements. Cycles on a roof rack - Some carriages on the Shuttle are double-deckers and some are single. If you are carrying bicycles on the roof of a car that make the car more than 1.85 meters tall (about 5.15 feet), tell the agent when you book your travel so that you can be assigned to an appropriate carriage. The tunnel is the most comfortable and humane way to travel across the English Channel with a pet. Your animal stays with you the whole way. If you are coming and going from the UK with a dog or cat though, the animal must be proven rabies free, microchipped and registered for the UK Pet Travel Scheme (PETS), which takes some advanced planning. Arrive at least half an hour before your departure (and not more than two hours) to allow time to check in, get into the boarding lanes and go through British and French security and frontier controls. In addition to passports and visas (if required) for all passengers, you'll also need registration documents and proof of insurance for your car. If you are traveling with a pet, you need to bring the required PETS paperwork and allow some extra time for your animal's passport and microchip to be checked. You may be able to get aboard the next available shuttle, paying in pounds, euros or by credit card. But it's more expensive than booking in advance and you aren't guaranteed a place. During busy times of day or at the start of European school vacations, you could end up waiting quite some time to board a shuttle. But you can still be almost spontaneous. 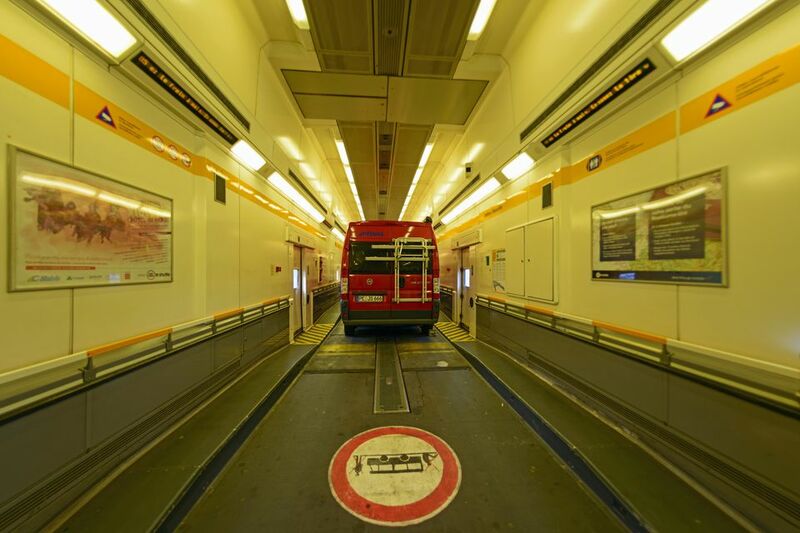 Shuttles through Eurotunnel can usually be booked as little as a day in advance. Can You Accidentally End Up on the Wrong Side of the Road? Yes they drive on the right in France and on the left in the UK but those clever engineers who designed and built this wonder of the world thought of everything - including how stupid some of us drivers might be. Roads are engineered to guide you to the correct lane both getting in and out of Eurotunnel. By the time you have gone through British and French passport control and customs and are ready to leave the private roads on the Eurotunnel sites, you've adjusted to the correct side of the road for the country you are in. Eurotunnel is priced to encourage day-trippers and short visits - and it only takes 35 minutes. If you're renting a self-catering cottage in Kent, you can hop across to stock up on cheaper wine and beer, cheaper cigarettes if you smoke, plus lovely French cheeses and groceries to stock your cupboards. Touring in the south of England? Pop across the channel for lunch, a visit to Northern France and a change of scene. The Pas de Calais region, near the tunnel exit in Coquelles, has lovely beach resorts, Flemish-influenced villages and great beer. There are also some wonderful restaurants. Try le Grand Bleu near the ferry port in Calais or the restaurants in the pretty town of Montreuil-sur-Mer. And if you are coming over from France, there's plenty to do within easy reach of the tunnel's Folkestone terminus. Thirty-five minutes is a pretty short trip but if you arrive early, have to queue to board or have a long drive once you're through the tunnel, you could get hungry. I find the shopping and catering at Eurotunnel facilities on a par with airport duty free - pretty conventional, over priced and not very nice. And once you've entered the Eurotunnel site, you can't really leave without repeating all the frontier security checks. So allow some time to visit Calais first. See Rodin's original bronze of the Burghers of Calais and learn their heroic story, shop the Calais hypermarkets for wine and bargains, then pick up one last French picnic and head for the tunnel at Coquelles. Where:The tunnel joins Folkestone in Kent with Coquelles, outside Calais. It has its own motorway exits, leading straight to check-in at both ends. from the UK take junction 11A off the M20. Schedule: Up to four departures per hour (from both directions) in bookable 2-hour windows, round the clock. Fares: One way fares start at £79. But you'd be smarter booking a round trip. Day trips and overnight stays start at £23 each way and short stays of up to five days start at £59 each way. The fare is per car (prices as of 2017). Motorcycle fares start at £12 and in 2017 bicycles cost £20 each way.